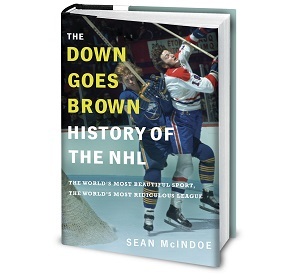 Down Goes Brown: One year later: Who has the best Cup odds over the next five years? One year later: Who has the best Cup odds over the next five years? About a year ago, I wrote a three-part series at Grantland that tried to answer a surprisingly tricky question: Which NHL teams had the best odds of winning a Stanley Cup within the next five years? It was a fun project, and it generated plenty of feedback from readers, some of which didn't even include the word "idiot". I won't be doing a sequel this year, but I thought it might be interesting to look back at that series and see how it holds up with the benefit of a season's worth of hindsight. We've got four years left on our five-year window, so the clock is ticking. Let's see how things look. Part one featured the ten teams I thought had the longest odds. It holds up reasonably well – the Devils and Hurricanes were somewhat better than we thought they'd be and obviously the Maple Leafs' odds look better today after their lottery win, but for the most part the bad teams are still bad. Three teams stand out here as questionable calls. I short-changed the Panthers, whose impressive young core didn't come especially close to a Cup but have already won a division title. The Predators also should have been higher, which plenty of people told me at the time. And then there's the one team that really sticks out here: the San Jose Sharks, who were slotted in at #22 and then went out and fell just two wins short of making me look really bad with a Stanley Cup. That would have hurt, even though I did acknowledge that they "could be a surprisingly good team this season". But I think I stand by my main point here, which is that the Sharks are very close to needing a tear down early in our five-year window. That now looks like it may come next offseason, with Joe Thornton, Brent Burns and Patrick Marleau all hitting UFA status, and I underestimated how good San Jose would be in the short term. In hindsight, they should have been higher on the list, but I'm still not sure I'd move them up all that far. These were the teams whose odds were decent but not great, and there wasn't much separation. Nothing here really stands out as being awful. I had a few readers argue that the Flames and Jets were too low on the list given that both were talented young teams coming off a playoff appearance, but those two rankings hold up better now that we've seen both teams regress. The Blues and Stars are too low, especially after Dallas made the leap to the league's top tier, and I was clearly way too high on Columbus. But overall, I don't think anything here is too cringeworthy. And that leaves us with the ten teams I thought were in the best shape. On the one hand, Montreal at #10 looks way too optimistic after last year. On the other, I spent most of their section arguing that they wouldn't win a Cup until they fired Michel Therrien, so at least that holds up. Most of the rest of the section does too. The Islanders are too high, and the Ducks would be much lower if I re-did the list today after their coaching change. But I was out in front of the Capitals surge to the top of the standings, so I'll give myself partial credit for that. And if I had to redo the list today, I still think the Lightning would be the top team on the list. The two most controversial picks from this section were the Oilers and Sabres. Remember, we've got a five-year window here, so it couldn't just be a list of teams that were contenders at the time. I think I'm still OK with these two, although after seeing Connor McDavid in action I'd swap their spots and have the Oilers up higher. And then there's last year's Cup winner, the Penguins, who thankfully do appear in the top ten. They're only at #8, but that's because I figured they only had a year or two to win it all before they'd run into major trouble with the salary cap and a weak prospect pipeline. I still think that's true, so I'm good with where I had the champs. Overall, I'd give myself a B+. There are a few ugly misses in here, but only a few, and with four years left in the window I still think most of the rankings could be defended. No glaring issues, even the Montreal pick probably leaned heavily on Carey Price. No one thinks they have a well constructed line up would succeed without him but you'd have been a little nuts to say one of the best goalies in his prime throughout the 5 year window would not be capable of dragging a mediocre line up through a few playoff rounds. As a Devils fan, I can't argue. Heck, I couldn't believe they made it to finals a few years ago against LA. Don't know if I'd classify the Sharks as a teardown. They have a seemingly solid #1 goalie for the next few years and even if Thornton, Marleau (please please) and Burns move on a solid core. The question is pipeline talent and I think they have a few pieces to replace the UFAs. The remaining core is good for another 2-3 years (Pavelski, Couture, Vlasic, Hertl, Braun, Doonskoi). I feel better about them than the Kings, Ducks, Wild, Preds and Blues. They could make it back to the finals this year.